Ever find yourself in the situation where you have to open a beer that doesn't have a pop top? Well, if you hang out with the Coastal Pirates you certainly won't have that dilemma where our most exotic choice is Ballantine. But for those rare occurrences when you're sucking down an Amstel and don't want to chip your nails, we're unveiling the Ahoy opener. Made of 100% pure plastic, these Hong Kong-made bottle openers are the best thing to happen to the Pirates since Craig Sudol was thrown off the O'Neills and had to join us. 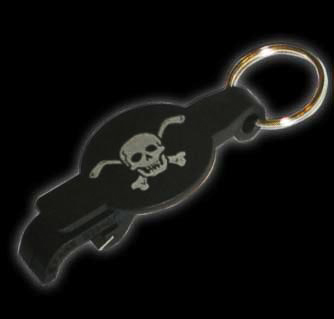 Emblazoned with the fearsome Pirates' logo in sliver on top, these beverage wrenches attach handily on your keychain so you can easily spot your car keys when you pick up your truck at the Ford dealership and find that they've cut your brake cables.